That's the kind of Circus McGurkus I've got!" This dress certainly has more than forty-four commas, and many more dots! 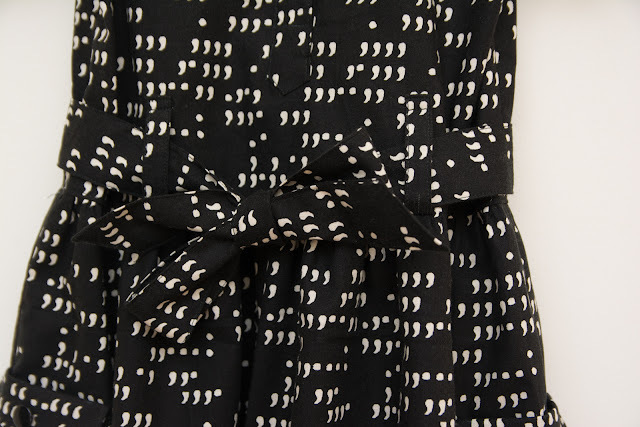 I first saw this fabric about three years ago and loved the idea of a punctuation dress. I bought the fabric an embarrassingly long time ago (from Urban Sew) and stashed it away. 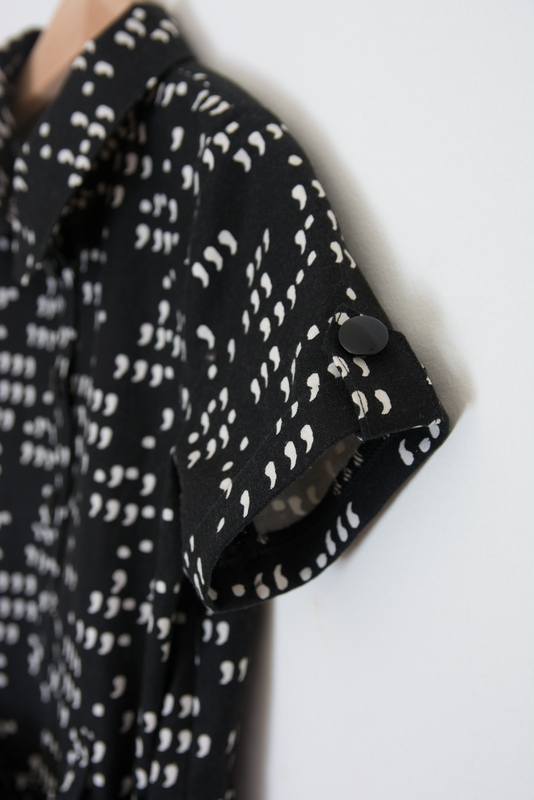 With the Oliver + S monochrome challenge underway it seemed the perfect time to finally sew it up. I didn't get a lot of enthusiasm from A when she first saw it, but once I got "If I Ran the Circus" off the bookshelf and read her the passage about the Juggling Jott, and pointed out all her commas and dots, she was all over it. Personally, I love it. The pattern is the Oliver + S Jump Rope dress and it never fails to please. This is my third version of View A (here's the first and second) and I've made view B three times before as well (one, two and three). I've also used the pattern to make a girl's polo shirt and borrowed the placket instructions for a boy's polo shirt. If you want to feel like a sewing rock star then sew this placket. You are guaranteed to be doing the happy dance around your sewing table and feeling very smug. 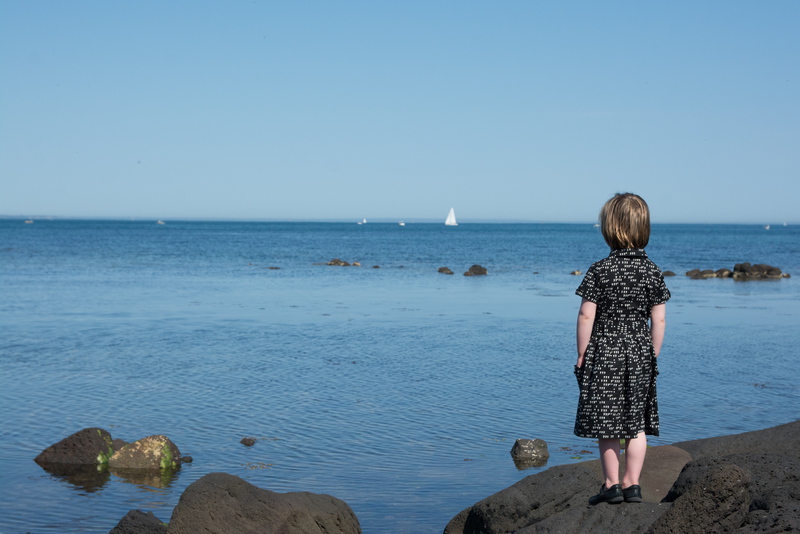 The very first dress I made for A was this pattern. I made a size 2, simply because I could not see myself dressing a non ambulatory baby in such a detailed dress. When I'd finished, it looked enormous and I could barely imagine her ever growing into it. But she did eventually grow (oh those first 20 months seemed to go on for ever) and she wore it until she was almost 4 years old. 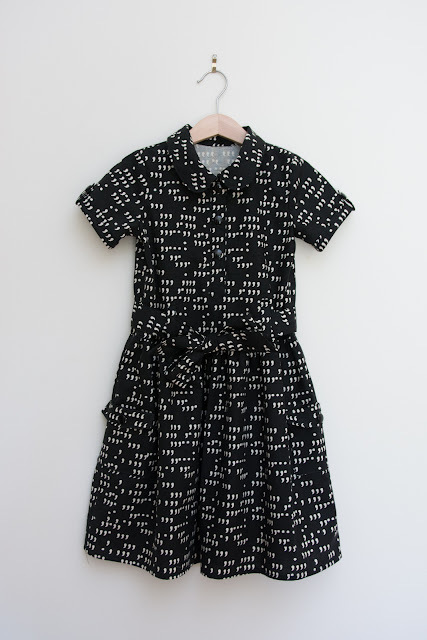 It's a fairly generously sized pattern, but at the same time it's one of those dresses that is best put on by putting the kids hands in first then arms above their head to bring it down and get the shoulders in. Anyway, without measuring her, I randomly nominated a size 4 with the skirt length extended to the size 5 line. And it's a perfect fit. While I'm prone to turning my nose up at quilting cottons, whenever I do sew one I find it refreshingly easy to work with. This Moda fabric behaved very nicely and while it's a coarser fabric to the Art Gallery quilting cottons that I last used, it drapes nicely and still feels soft. Summer has come early, and somewhat ferociously, so we headed down to the beach to play and take some pictures. 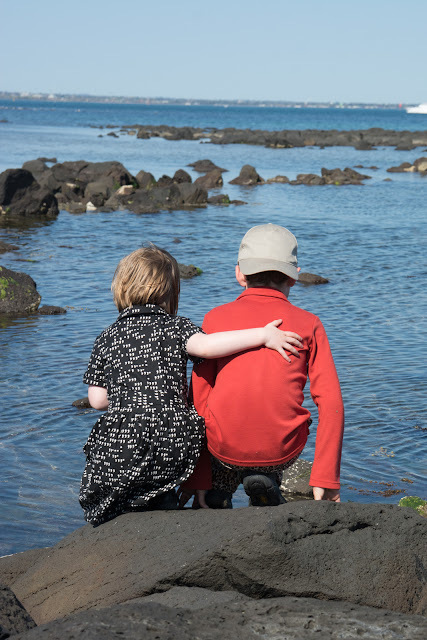 At first she wanted to hold my hand to get from one rock to another, but within a few minutes she was leaping and following P as best she could. It's amazing to watch those physical skills get practiced and the confidence that comes with it. Of course they both ended up with wet shoes, but hey, it was warm. If I had my choice between sitting and watching organised sport on a Saturday morning, or watching rock hopping I know which I'd choose. If only the dead sea birds didn't smell so bad. This dress is fantastic! 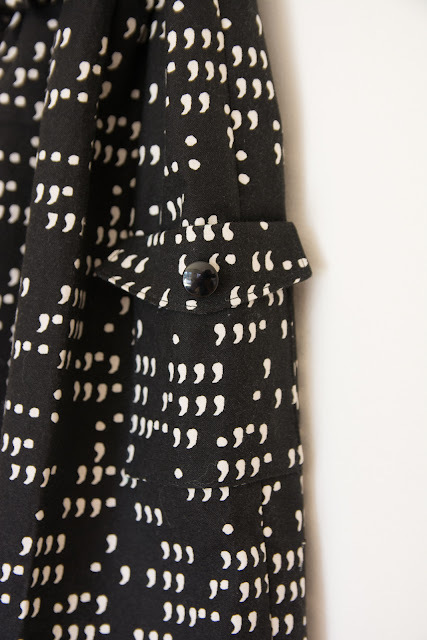 And I adore the grammar geekiness of it! They do kinda look like quotation marks to me, though, the double " US style. :-) So I'm imagining her posing with "finger quotes" - right?! I love this pattern so much! I have it but I admit, I am a little intimidated by the amount of work and it seems to really suit the older girls best. Thanks Sarah. I take my Dr Seuss readings quite seriously. It's my version of performance art! 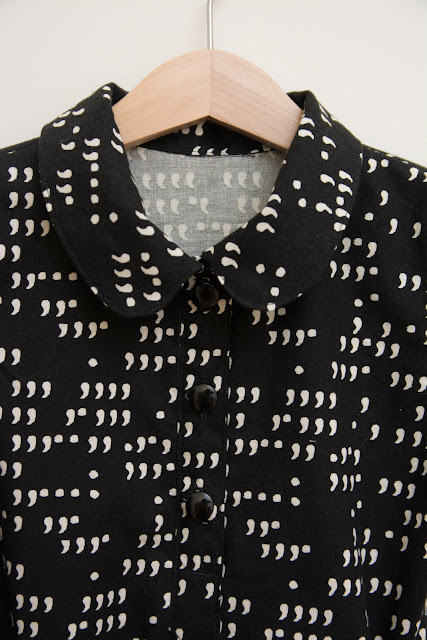 Beautiful dress and lovely photos - I like how the fabric looks abstract from a distance, but becomes grammatical when close up :) And commas/quotation marks and full stops are SO much cooler than the over-used ampersand! Thanks Marisa. I hadn't thought to stand back and squint at the fabric and it's only now that I see the photos that I appreciate there's a slight vertical stripe effect. Pure luck then that those "stripes" seem well placed! Giant ampersands don't do much for me either! I want the adult version of that. What a well-dressed little girl! Cheers Nicole! I'm all inspired to retackle the shirt dress for me that I'd started a muslin for after this dress, so, me too I guess! What a great dress and do hope she does wear it to school orientation. Love the last photo. Thanks Sharon. I hope she does, but I dare not suggest it. Her contrariness is legendary! There's nothing better than a big brother to lean on when you feel you might fall, I was happy to have had the camera at the ready. I cannot believe I hadn't commented on this already! I always read your posts right away, but I have the most obnoxious time commenting from my phone! This dress is perfection! I love it! Such beautiful details, too! And yes, I totally agree with you on the organized sports thing! When my kids were in school the sports activities started in kindergarten. They would have soccer in the fall, basketball in the winter and t-ball or swimming in the spring/summer. Most of the school year was soccer and basketball. It was way too much. My kids are never going to be great athletes (with the possible exception of Tia who is a very fast runner. Indigo's legs come up to Tia's shoulders and Tia is still faster than her!). I am all for kids being outdoors and getting physical exercise, but mine now do it through biking, running, playing tag and other childhood games. And that is great with me! Dan works 65-70 hours a week and I am so glad we have our weekends again.